For eight years Republican Gov. Scott Walker kicked the can down the road when it came to the state transportation budget and the result was an increase in badly maintained roads, potholes, rutted and rough surfaces. And that in turn increased the costs for car owners, causing higher repair costs, increased fuel consumption and tire wear. A 2018 study by TRIP, a national advocacy group for better roads, estimated that deteriorating roads cost Wisconsin drivers a total of $6.8 billion each year. But Walker couldn’t bring himself to raise the gas tax, as it is not popular with voters and so, for eight years, he underspent on the state’s roads and borrowed heavily for any spending he did do. But there was another solution Walker could have pursued, a classic user fee that would have directly charged the folks destroying our roads for the damage they do: tax the trucks. The evidence is overwhelming that trucks are the main cause of all the deteriorating roads in America. An oft-quoted federal study once found that road damage from one 18-wheeler is equivalent to the impact of 9,600 cars. A fully loaded tractor-trailer weighs 80,000 pounds, 20 times more than a typical passenger car at 4,000 pounds, but the wear and tear caused by the truck is not 20 times worse, but 50 or 60 or more times worse. One analysis contends that freight-hauling trucks cause 99 percent of wear-and-tear on US roads, but only pay for 35 percent of the maintenance. Some states, like Kentucky, New York, New Mexico and Oregon, have passed a new per-mile fee on heavy trucks to help recoup the cost of the damage they do. But Walker never uttered a peep about taxing trucks. And for good reason: he was getting huge donations from the trucking industry, some $702,000 between January 2010 and December 2016, as a Wisconsin Democracy Campaign (WDC) analysis found. But Walker is gone and Gov. Tony Evers has presented a budget that includes a 27 percent increase in the registration and title fees paid by trucks, generating about $36 million over the next two years. 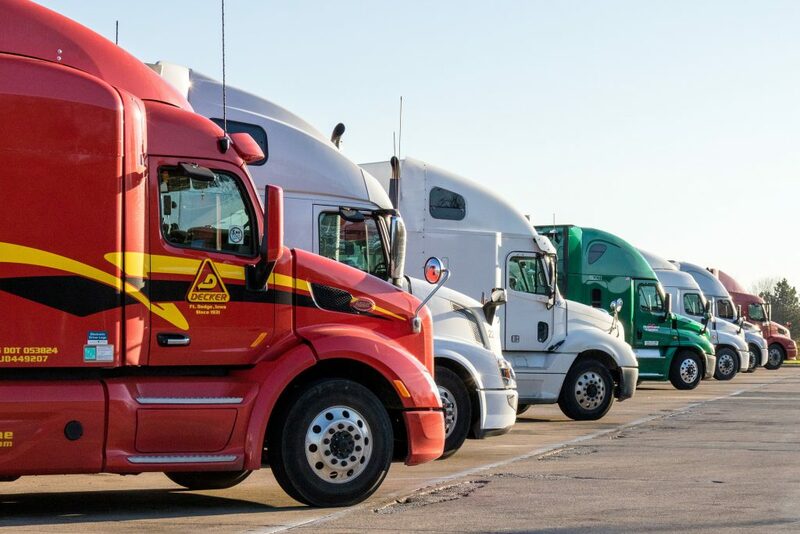 The higher fees are “a way to acknowledge that the heavier trucks have an impact on our roads,” as Craig Thompson, the state Secretary of Transportation, told legislators. If the approach sounds familiar, it’s because a similar proposal was offered by Republicans in 2017. Rep. Amy Loudenbeck (R-Clinton) proposed a new mileage-based registration fee for trucks that weigh more than 8,000 pounds, an approach similar to that passed by other states. Assembly Speaker Robin Vos seemed positive, declaring it was “one of the potential pieces” that would lead to the passage of a new state budget. Except that Republican state senators quickly chickened out on the proposal, which was killed one day after Vos welcomed it. Why? Perhaps because trucking industry contributions to legislators between January 2010 and December 2016 totaled nearly $283,000, with 94 percent of it, nearly $267,200, going to Republican lawmakers, as the WDC found. So now many of these same legislators are faced with a similar proposal, but this time proposed by Evers, and the silence is deafening. To date, not one Republican legislator, including Loudenbeck, has come out in favor of the fee on trucks. “Why are you guys hammering heavy trucks?” asked Sen. Tom Tiffany (R-Minocqua) of Thompson at the budget hearing last week. But of course Tiffany knew the answer, one that had been carefully explained by Loudenbeck not that long ago. Tiffany’s opposition is no surprise. According to the WDC, he received $9,700 in individual and political action committee contributions from trucking companies between January 2012, the year he was elected to the state Senate, and July 30, 2018, the latest date that campaign contribution data has been analyzed by the group. And Tiffany is no doubt also aware that the Republicans’ continued dominance in the legislature has been heavily backed by campaign donations from the industry. Indeed, the industry is a big player in the state Capitol, spending $680,000 on lobbying over a 10-year period and getting 31 bills it supported turned into laws, as the WDC reported. The industry has also succeeded in evading enforcement of statutory limits on overweight trucks. Walker’s Department of Transportation “proposed adding 24 new highway inspectors in the 2013 state budget, citing a DOT study that showed overweight trucks cause $41 million in pavement damage annually in the state,” as Wisconsin Public Radio reported. But the Republican-led Joint Finance Committee rejected the plan. It’s truly a scandal the way our elected representatives are allowing trucks to destroy our roads and highways and then cowering before any proposals to charge the industry for the damage caused. Actually, he has it in reverse. We all pay — every single taxpayer in the state — for damaged roads through both our state and local taxes, as well as the cost of massive state borrowing that may be handed down to our children. By contrast, a user fee will be charged to the trucking industry, and yes, to anyone who buys or sells products moved by the trucks. It’s a cost of doing business the industry has been passing on to taxpayers. The true conservative policy, as Loudenbeck explained, is to charge a user fee for the deterioration of roads. But Wigderson and Tiffany and Republicans prefer the solution they constantly deride liberals for doing: stick it to the taxpayers. Higher truck fees would NOT all be passed on to consumers. HIgher trucking fees would cause some shipments to switch to rail. One major reason we have so many long-haul trucks is that highways are subsidized and train tracks are not. Shipping stuff by rail is inherently cheaper, uses less fuel per ton-mile, and causes less collateral environmental damage (stormwater runoff and road salt). Railroads are far cheaper to maintain than highways. Trucking gets propped up by highway subsidies while railroads pay right-of-way property taxes not charged to highways.